Kent State University Press, 9781606352113, 88pp. "It's a joy. . .to come nearer to a realm of experience little explored in American poetry, the lives of those who are engaged in the complex project of transforming their own gender... Oliver Bendorf writes from a paradoxical, new-world position: the adult voice of a man who has just appeared in the world. A man emergent, a man in love, alive in the fluid instability of any category." "Bendorf's collection indeed opens the door to a spectral wilderness, an otherworldly pastoral, a queer ecology endlessly transformed by possibility, grief, and the unruly wanting of our names and bodies. 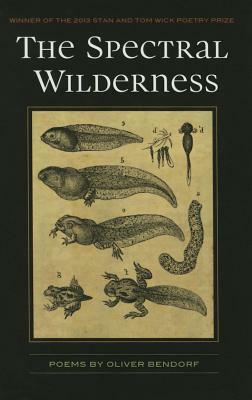 Stunningly lyrical and beautifully theoretical, The Spectral Wilderness is an invitation one cannot turn down; the book calls us to travel with Bendorf, to study the topography of becoming because "what we used to be matters" in the way that language matters--however fleeting, however mistaken, however contradictory it might be." "What gorgeous and ravenous rackets Oliver Bendorf's poems are made of; what a yearning and beautiful heart. 'Lift a geode from the ground and crack me open, ' he writes, which is more or less what these poems do for me: break me open to what might sparkle and blaze, what might glisten and burn inside. The Spectral Wilderness is a wonderful book." Oliver Bendorf was born in Iowa City. He received an MFA in poetry from the University of Wisconsin and currently lives in Madison. His poems have appeared in Blackbird, Indiana Review, jubilat, Ninth Letter, Tupelo Quarterly, and elsewhere, and anthologized in Best New Poets and Troubling the Line: Trans and Genderqueer Poetry and Poetics. He has received fellowships from Vermont Studio Center and the Lambda Literary Foundation.